Jeremy Wade is a world renowned extreme angler and fish biologist who has travelled the globe in search of mythical monster freshwater fish. Originating from the Bristol region of England Jeremy Wade has a degree in zoology and qualifications in biological science. Jeremy Wade is also a well accomplished angling author and has written several books such as the acclaimed ‘Somewhere down a crazy river’ recounting his early days of pioneering on India’s legendary Mahseer rivers. Extreme angler Jeremy Wade continued his global fishing adventures with an expedition to the Amazon in search of the legendary Pirarucu or Arapaima reputed to be the world’s largest freshwater fish.The TV show entitled Jungle Hooks was an instant success and saw Wade catapulted to recognition as one of the worlds most extreme and determined fisherman. The original Jungle Hooks was soon followed up by an equally successful sequel which saw Jeremy pursuing a mythical Mahseer in the River Cauvery in India. Jeremy Wade is currently the host of Discovery Animal Planet channels River Monsters TV series which sees the intrepid angler venturing to remote exotic destinations in search of the largest freshwater fish on the planet. River Monsters filmed by Icon Films sees adventure angler Jeremy Wade researching stories and myths concerning murderous and dangerous freshwater fish species. Wade then travels to the specific location concerning each monster fish story before pitting his fishing skills, wits and physical endurance against his chosen piscatorial quarry. River Monsters combines amazing extreme fishing sequences strung together by a dramatic narrative by Wade which echoes a detective story following his ongoing quest to find the largest freshwater fish in the world and to prove or dispel that myths and horror stories which enshroud each monster freshwater fish. Jeremy Wade River Monsters. Death Ray. At the end of April 2009 the Fishsiam team was contacted by Extreme angler Jeremy Wade in connection to the possibility of guiding for a future episode of the hugely successful River Monsters TV show for Discovery Animal Planet. 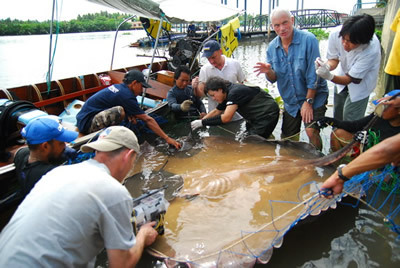 After previously swapping information with Jeremy Wade about Giant freshwater stingrays (Himantura Chaophraya) in Thailandthe extreme angler and fish biologist proposed an exploratory expedition the following week in search of Giant freshwater stingrays in the tidal rivers of Thailand. Arriving one week later extreme angler Jeremy Wade accompanied by Icon Films producer Stephen Gooder were greeted by a minibus in the Lat Phrao district of Bangkok. Two hours later the extreme angler arrived at the Maeklong River in Samut Songkran and immediately began fishing for Giant freshwater stingrays. Purposely coinciding the trip to correspond with the incoming tide the angler wasted no time in landing two small Giant freshwater stingrays which were duly examined by the Chulalongkorn University research team before being released. At the end of the days stingray fishing both Jeremy Wade and the producer were in agreement and excited at the prospect of the forthcoming television production of River Monsters. Two weeks later Jeremy Wade once again returned to Thailand this time accompanied by a full film team and production crew. The expedition began once again at the scenic Maeklong River near Samut Songkran a short two hour journey from Bangkok. On arrival at the Maeklong River and after stowing all equipment into the boats Jeremy Wade accompanied by the film crew began to power upriver towards the infamous Area 51 section of the mighty tidal river. After fishing for only a short period of time and with the tide at its highest point one of the baits was picked up by an unseen prehistoric predator twenty metres below. Winding down into the monster fish saw the rod violently arch over towards the surface of the river as the heavy big game gear took the full weight of the fish. Using his own powerful 7ft stand up rod Jeremy Wade battled the fish for an arm numbing hour and a half before it started to show signs of tiring. With the unseen Giant freshwater stingray now languishing in the middle layers of the water extreme angler Jeremy Wade slowly cranked the stingray to the surface. With the monster stingray clearly a matter of metres below the surface Jeremy Wade gave one last lift of the rod. nSecond’s later disaster struck as the heavy monofilament leader snapped under the immense weight of the stingray! With just a fleeting glimpse of the stingray’s rostrum (nose) breaking through the surface there was a massive swirl in the water before the River Monster sank down into the murky depths of the tidal river and out of sight. The Giant freshwater stingray had clearly been a gigantic leviathan weighing well in excess of 200kg’s with a massive 2 m+ wingspan dwarfing anything previously captured by Jeremy Wade in his previous angling expeditions. After regaining his composure Jeremy Wade retackled with a shorter 5ft 6 “ stand up rod coupled with his trusty Shimano multiplier. With several hours left of productive fishing time Jeremy repositioned himself in the exact area of the previous stingray encounter and dispatched fresh livebaits to the riverbed. With the tide still indicating the high chance of another take Jeremy Wade waited patiently for events to develop. Within a mere thirty minutes extreme angler Jeremy Wade was once again locked in battle with yet another River Monster. The battle on this occasion lasted a similar amount of time and saw Jeremy remarking that it felt like he was ‘attached to a plug at the bottom of the river’! As the epic battle raged on Jeremy called on all his physical reserves to shift the fish from its subterranean lair deep in the muddy riverbed. After moving the stingray off the muddy bottom the rod sprang back indicating the stingray had moved off of the bottom forcing Jeremy to wind furiously to regain contact with the stingray and keep it off of the bottom. As the gigantic prehistoric stingray broke through the surface the Fishsiam team carefully unfurled a net underneath the body of the stingray before safely ensconcing it in the folds of the heavy duty netting. 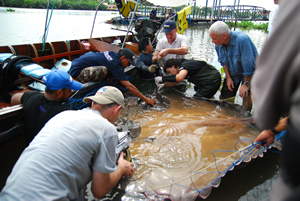 The River Monster was transported to the riverside where Dr.Nantaika Chansue from the Chulalongkorn University stingray research team in Bangkok carried out a thorough examination of the stingray. Various scientific studies were carried out on the stingray by the research team as the Icon Films cameraman expertly recorded events. Whilst carefully handling the Giant freshwater stingray in the margins of the river the large and clearly pregnant female miraculously gave birth to a live newborn stingray in front of the cameras. Moments later the newborn was followed by yet another baby stingray which was gently placed on its mothers back. The perfectly formed infantile stingrays happily waited on the back of their mother as the Chulalongkorn team conducted an ultra sound examination of the Giant freshwater stingray. On closer inspection with ultrasound equipment the large pregnant stingray was observed to be carrying another baby stingray which was obviously close to being born. Due to the stingrays pregnancy the decision was made as to not weigh the stingray and put the stingray under any undue physical stress. The prehistoric River Monster was estimated to weigh in the 185-195kg range and was measured to have a wingspan with a width of just over two metres. The ancient Giant freshwater stingray had an overall length in the excess of three metres with a particularily deep and bulky body. With the pregnant stingray showing good signs of recovery and holding more unborn young inside its massive frame the Death Ray was quickly returned to the tidal river. The River Monsters stingray expedition proceeded over the course of the next few days with several more Giant freshwater stingrays being landed from the Maeklong River by Jeremy Wade with a mixture of male and female stingrays falling to his extreme angling techniques. With filming commitments in the coastal town of Samut Prakan’s wholesale fish market Jeremy Wade and the Icon Films production team travelled to the immense fish market in search of Giant freshwater stingrays. After searching the market for stingrays and only finding marine species on offer Jeremy rightly stated the Giant freshwater stingray was clearly an elusive and rare fish and began the next stage of the expedition. The next stage of the River Monsters expedition saw Jeremy Wade, the Icon film crew and Fishsiam team travelling in convoy in a Northerly direction to the sleepy town of Nakon Sawan. On arrival in Nakon Sawan Jeremy Wade was soon speaking with an elderly local fishermen who recounted stories of epic battles with Giant freshwater stingrays fought out with traditional harpoons! The old fishermen also produced photographic evidence of a huge Giant freshwater stingray caught the previous year from the nearby Chaophraya River. In addition to the photographs of the stingray the old weathered Thai fisherman also produced another slightly more macabre memento of his legendary encounter in the form of a long dried out stingrays tail still complete with deadly barb! After hearing the stories from the old fishermen plans were quickly put in place to fish a two day session on the nearby Chaophraya River for Giant freshwater stingrays. With the Chaophraya River holding relatively low water levels at this particular time of year the anglers surveyed the river in search of deeper holding areas for the stingrays and chose to fish at a wide confluence of the river. The two day session on the Chaophraya River failed to produce a single stingray but saw Jeremy Wade and his fellow anglers experience several stingray type bites which left the large baits crushed to a pulp. Weather also conspired to hamper the stingray fishing and saw heavy rain showers and thunder throughout the majority of the session. After failing to contact the Giant freshwater stingrays in the Chaophraya River Jeremy Wade and the production team made their way to the world famous Nakon Sawan Aquarium where they filmed an underwater sequence which saw Jeremy Wade swimming alongside a large Giant freshwater stingray previously caught from the nearby Chaophraya River. With one week having already passed of the two week River Monsters Expedition Jeremy Wade, the production team and the Fishsiam team travelled to the Northern Province of Nong Khai and the mighty Mekong River. After a full day travelling in minibuses and an overnight stop to reach the far flung province of Nong Khai the River Monsters expedition finally arrived at the Mekong River. On initial inspection the river was clearly not displaying ideal conditions with water levels way below normal exposing large gravel bars far out in the centre of the extremely wide section of the Mekong River. With water levels once again making fishing for Stingrays problematic Jeremy Wade and the Fishsiam team tried various areas and techniques in an attempt to catch a Giant freshwater stingray from the Mekong River. Although the area had a record for producing Giant freshwater stingrays previously, a decision was made to relocate back to the Maeklong River which was still showing perfect conditions for the capture of Giant freshwater stingrays. The decision was further reinforced when Jeremy Wade and the fishsiam team were warned by the local Thai river police for venturing too close to the neighbouring Lao side of the Mekong River. 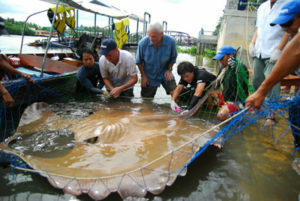 On arrival back at the Maeklong River in Samut Songkran, Jeremy Wade soon started to catch Giant freshwater stingrays from the Area 51 section of the tidal river. During the final days of the River Monsters expedition Jeremy Wade caught Giant freshwater stingrays each day but failed to catch anything close to the size of the previous River Monster. Throughout the trip Jeremy Wade assisted Dr.Nantaika Chansue and the Chulalongkorn University in the collection of scientific data including DNA and tissue sampling and the taking of toxicology samples from mucus concentrated on the stingray’s barbs. With the trip coming to an end and Jeremy Wade’s tally of Stingrays caught during the River Monsters Thailand expedition totaling eight fish the final day saw the Icon Films team eating one final meal on the banks of the Maeklong River before hurrying to the airport in Bangkok on their way to the next River Monsters fishing adventure. River Monsters Death Ray episode was aired in the USA on Discovery Animal Planet earlier in 2010 and is now showing in the UK on channels ITV1 and ITV4 and in various other countries across the globe.